The Nokia 9 is a smartphone that’s made rounds on the rumor mill since 2017. Nokia surprised everyone with the launch of the Nokia 3, and the gadget outperformed its competitors in sales in China. As a result, users who prefer flagship smartphones were on the lookout for such an offering from Nokia. At the time, the Nokia 9 was rumored to feature Qualcomm’s Snapdragon 835, but as two years have passed since this first report, it’s highly unlikely for the device to feature the 10nm processor. Today we’ve got another report for the Nokia 9, as the smartphone might launch later this month one day before the MWC in Barcelona. Take a look below for more details. Since it’s 2019, and if the Nokia 9 is a flagship, then one would naturally expect the smartphone to house the Snapdragon 855. Qualcomm’s latest processor is a near-complete redesign over its predecessor, and as a result, any device that does feature the 7nm SoC will see a marked improvement in performance across computing and rendering. 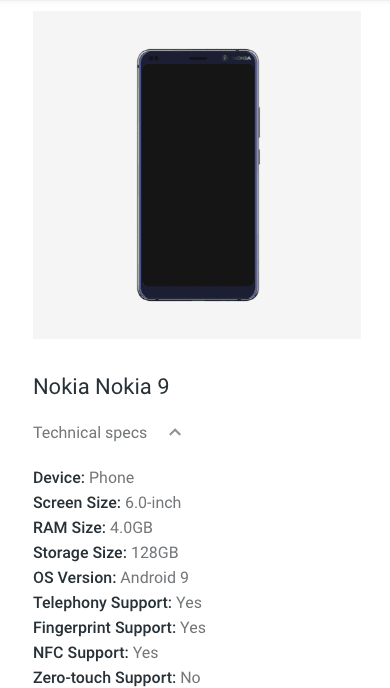 Today we’ve got a specifications listing of the Nokia 9 that details several of the device’s important details. However, it does not provide information about the smartphone’s processor. However, we do get information for the Nokia 9’s RAM, storage and display specifications. According to the details, the device will feature a 6″ screen, 128GB internal storage and 4GB of RAM. Additionally, the Nokia 9 will also allow users to make mobile payments courtesy of NFC (Near Field Communication) support. Apart from these few details, today’s report provides us with little information to go forward on. However, since the Nokia 9 has surfaced on the rumor mill for more than a year, we can nevertheless make a couple of educated guesses on what to expect from the smartphone. For starters, a rumor that surfaced in March 2018 claimed that the device will feature virtual fingerprint recognition. Combine this with the first image in the gallery above and either Nokia will place a physical sensor at the back of the smartphone, or the March rumor will turn out correct. Speaking of the device’s back, it has seen some spectacular rumors in itself. 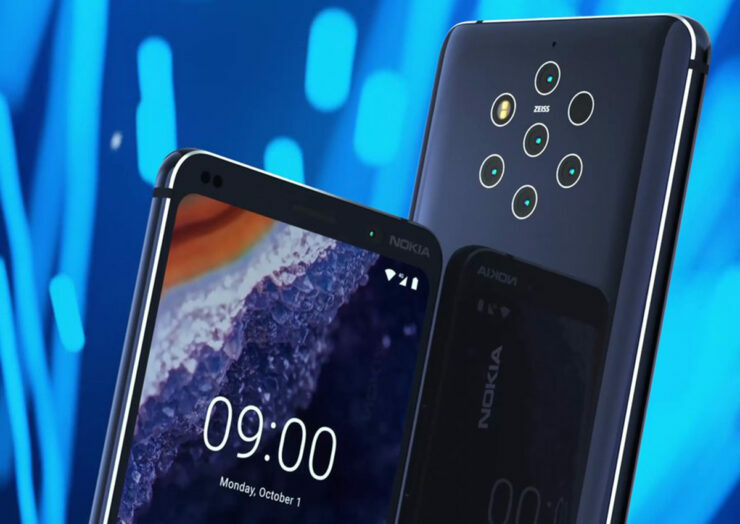 Several sources believe that the Nokia 9 will become one of the first smartphones to feature five camera sensors on its back. When evaluating this claim, keep in mind that the Snapdragon 855 can support either a single 48MP camera or two 22MP dual cameras. Keep in mind that the monicker ‘PureView’ refers to a high-performance camera capable of condensing a large number of pixels into a larger single pixel. Therefore, while the Nokia 9 might (will?) not feature a penta-lens rear camera setup, the device will set a new benchmark for smartphone photography. 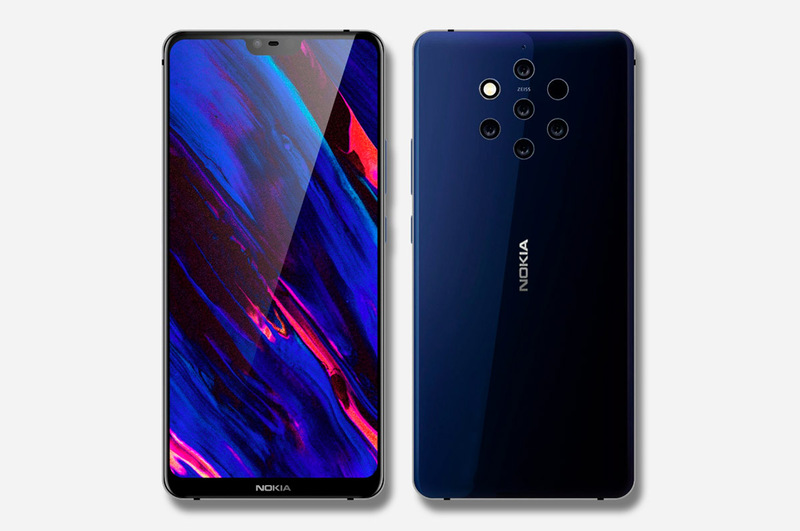 If Nokia executes its first PureView smartphone since the Lumia 950 XL correctly, then users who love cinematography on their gadgets will be in for a treat. All in all, this is a device that everyone needs to be on the lookout for. Thoughts? Let us know what you think in the comments section below and stay tuned. We’ll keep you updated on the latest.